%VIRTUAL-SkimlinksPromo%The original Mini, first introduced in 1959, is the best-ever British car, according to a survey of Autocar readers. The poll also named Norfolk-based Lotus as the most popular British manufacturer, with seven of its models making the 100 best British cars list. Following the Mini at the top of the list was the McLaren F1, with the Jaguar E-type third and the Range Rover fourth. Jaguar and Ford both had six cars in the top 100, including the Jaguar D-type and the Ford Sierra RS Cosworth, while Aston Martin had five, including the DB5 - a favourite with 007 James Bond. 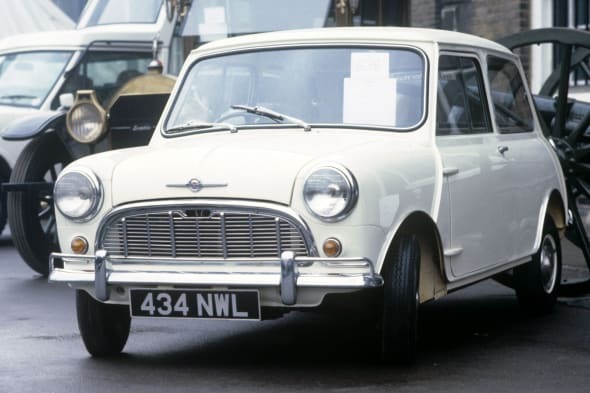 Created by Sir Alec Issigonis, the Mini achieved worldwide fame, being dubbed the first "classless car". The marque was successfully revived in a larger and more-powerful version by BMW in 2003. Autocar brand editor Chas Hallett said: "It comes as little surprise that the original Mini has topped the list of all-time British greats. "It's such an iconic vehicle and represents a lot more than the British car industry; the Mini is associated with Great Britain around the world and, in many ways, it was ahead of its time." He went on: "Everyone loved and still loves an original Mini. It ensured a fabulous drive every time, with a wheel literally at each corner and a low centre of gravity, plus it was cheap to own and run. "Many a former owner will undoubtedly be wishing they had held on to theirs, as good examples are now worth tens of thousands of pounds." Nissan Qashqai, a British-built sports utility vehicle (SUV), has been named What Car? car of the year for 2014. The compact Hyundai i10 1.0 66 SE has been named What Car? city car of the year 2014. Ford's smallest car, the Ford Fiesta 1.0T 100 Ecoboost Zetec 5dr has been named What Car? small car of the year for 2014. The Skoda Octavia 1.2 TSI SE has been named the What Car? family car of the year for 2014. The Volkswagen Golf Estate 1.6 TDI SE Bluemotion Tech has been named What Car? estate car of the year for 2014. The stylish Porsche Boxster 2.7 has been named What Car? sports car of the year for 2014. The smart technology Citroën Grand C4 Picasso 1.6 e-HDi 115 Exclusive has been named What Car? MPV of the year for 2014. This undated image made available by BMW shows the 2014 BMW 435i Coupe. (AP Photo/BMW) The BMW 435i M Sport auto has been named What Car? coupé of the year for 2014. The Ford Fiesta 1.0T 100 Ecoboost Zetec 5dr has been named What Car? hot hatch of the year for 2014. The Nissan Qashqai 1.5 dCi Acenta 2WD has been named What Car? small SUV of the year for 2014. The Range Rover Sport has been named What Car? large SUV of the year for 2014. The Audi A3 Saloon 2.0 TDi Sport has been named What Car? executive car of the year for 2014. The Audi A3 Cabriolet 1.8 TSi S Line has been named What Car? open-top car of the year for 2014. The Mercedes-Benz S350 Bluetec L SE Line has been named What Car? luxury car of the year for 2014. The BMW i3 electric car has been named What Car? green car of the year for 2014. The Nissan X-Trail has been awarded the What Car? reader award 2014. The Nissan X-Trail will be on sale in July 2014.